A second dead whale has washed up along the tiny coastal town of Pacifica, this time about half a mile from where the first one was found about three weeks ago — and its removal is still tangled up in a jurisdictional tug-of-war. The young 32-foot female humpback whale was spotted on Monday at Sharp Park State Beach, and is already drawing crowds of onlookers taking photos, some with fingers crossed that this one won't stink and rot on the sand as the first one has been doing since it washed up at the same beach closer to Mori Point on April 15. "I'm sorry to see it, it's quite a sight," said John Valentini, 74, of San Bruno. "I have no idea what's going on." 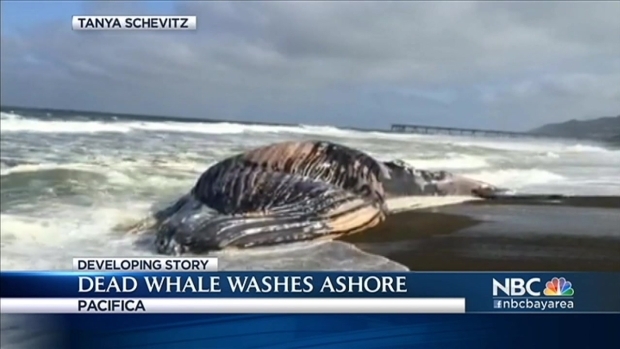 Sue Pemberton with the California Academy of Sciences was out at the beach Tuesday morning and told NBC Bay Area that she doesn't think there's anything particularly wrong with the ocean, or that there is an epidemic of dead whales. 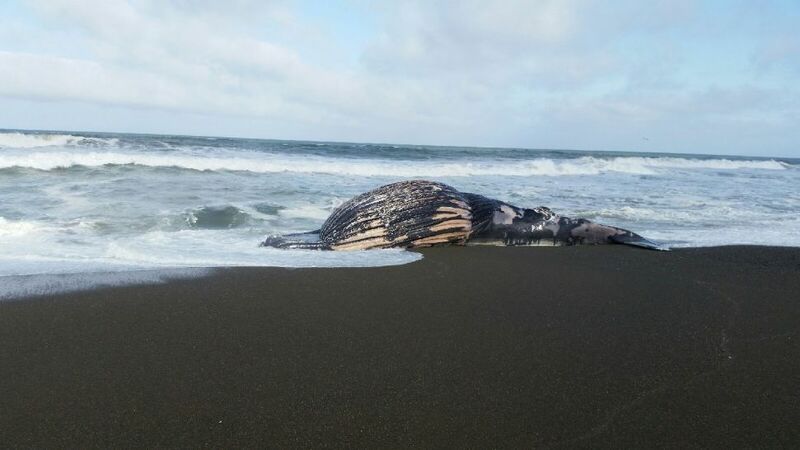 A second dead whale has washed up along the tiny coastal town of Pacifica, this time about half a mile from where the first one was found about three weeks ago. "I think it's a coincidence," she said. "They are two different species and age classes. There are pretty strong onshore winds at this beach, and it lends itself to being a repository for dead marine mammals and garbage. I'm not surprised. Animals die." A necropsy is scheduled for Wednesday to give scientists a "fuller picture," she said. Scientists still don't know what killed the adult sperm whale — which is about twice the size of the female humpback — after they performed a necropsy on it. As late as this weekend, the whale's carcass was laying on the beach, causing a horrific odor as birds pecked away at its decaying flesh. The whale hasn't been moved, according to Police Chief Dan Steidle, because no jurisdiction has yet to claim it. Steidle told NBC Bay Area that the dispute is whether the first whale's body lies on the property of the city of Pacifica, the federal Golden Gate National Recreation Area that embodies Mori Point, the city and county of San Francisco's Recreation and Park District that owns a golf course nearby, or the state of California. He said Pacifica is waiting for a ruling to decide who will move the whale and how to move it. 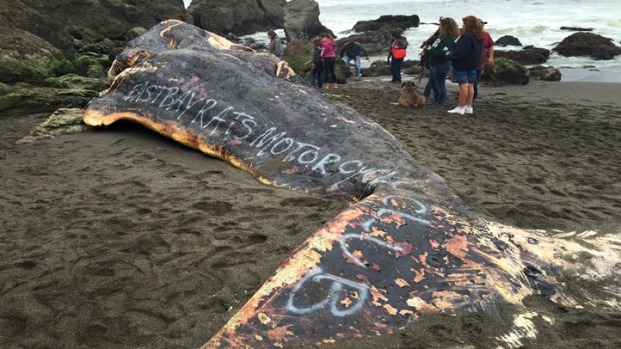 Many people were shocked Wednesday were shocked to see graffiti on a dead whale's body in Pacifica. Michelle Roberts reports. Scientists at the National Oceanic and Atmospheric Administration said the best thing to do is to tow the whale back out in the ocean, but at this point, it may be too late, he said, because the carcass of the sperm whale is deeply embedded in the sand. As for the humpback found on Monday, Steidle said; "This one is definitely San Francisco's." Spokeswoman Laura Sherr said the Marine Mammal Center in Sausalito has responded to 21 humpback whales and 17 sperm whales that washed up on beaches — most of which were dead — in its 40-year history.